The two provinces kick off their RaboDirect PRO12 season’s today. 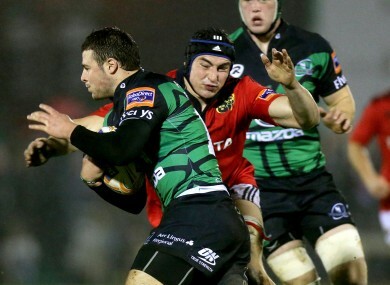 Connacht's Robbie Henshaw and Tommy O'Donnell of Munster. WE CAUGHT UP with four passionate, provincial rugby supporters and asked how they felt their team’s would fare this season. On Friday, we shared the thoughts of Leinster and Ulster fans. Today, we ask fans from Munster and Connacht to big their provinces up. The arrival of Pat Lam heralds a new era in the west. As supporters, we hope that this is the year we bridge the gap and get into the top half of the league table. We have steadily improved on our position and points total over the last few seasons. This year we want to see us winning the tight games when we are the better team. Our fans are generally fair if we have given everything and are beaten by a better team fine. It’s when we lose to a team where we haven’t performed, that it’s annoying. We want to shake off that ‘plucky loser’ title. Nothing I think infuriates us as much as that. Whether it’s meant in a condescending tone or not, it comes across like having your hair tussled when you were a young lad by the scorer who went passed you like you were standing still. (Of course you bided your time and dropped a knee or elbow in to him went the ref wasn’t looking). The arrival of Craig Clarke is a real coup for us. James So’oialo will be a welcome addition and should liven up our backline. The return of Connacht’s leading try scorer speedster Fionn Carr is a welcome homecoming. Added to this the stellar performances last season from new arrival Willie Faloon (Connacht Clan player of the season) and the youngsters Robbie Henshaw and Kieran Marmion who looked like very much at home in their inaugural season. The fear we always have is that we are only a few injuries away from being a depleted side. It is very difficult for an Academy player to suddenly step up to the senior team but the academy has done well in recent years in producing these players and with Pat Lam having the Academy training with the senior squad it can only be a good thing. Snooker player Ken Doherty once said: “The five S’s of sports training are: stamina, speed, strength, skill, and spirit; but the greatest of these is spirit.” It is a philosophy which can be applied, to many different teams, but, in particular, Munster. Munster have time and time again won in heart-racing, and spine-tingling fashions, and defied the odds. Their home ground is renowned worldwide for the ‘Thomond Park Silence’ and they have only ever lost two Heineken Cup games in the Limerick stadium. This season marks a new beginning for the province, as they will be without one of the heroes of Munster Rugby, Ronan O’Gara who has gone onto pastures new in France. Waiting in wings are Ian Keatley and JJ Hanrahan, two young players, who have proved their talent on both the provincial and international stages. The competition for a starting spot for these two out halves, promises to be an exciting battle. As any fan knows, one of the best things of sport is witnessing the rising and emerging of new fresh talent each season. Happily for Munster they have many players, who are ready and waiting to become the next legend. Ronan O’Mahony who scored a hat trick in the pre-season friendly against London Irish last week is just one of the players eager to get his starting spot on the squad. Simon Zebo, James Cronin and Conor Murray, to name a few, are just a small selection of young talented players who have pledged their future to the province, and will no doubt delight the loyal fans for many seasons to come. Last season saw Munster loose the Heineken Cup semi final against a star-studded French side Clermont, in what was a well fought battle. Every Munster player fought hard that day, and did their province proud. The pain from that defeat, will drive them on this season. The older players on the squad are determined for silverware, and the younger players are keen to show what they are made of. In both pre-season games, Munster fought hard for a win, and this is a trend that they are determined to continue. The squad are gelling well together and there is great air of excitement among the players, who cannot wait for the season to start, and to begin their quest for silverware. With an abundance of youthful players emerging, and a senior squad who are hungry for success this season has the potential to be one to remember and the fans can look forward to, what should be a fantastic season for Munster. How do you think Munster or Connacht will fare this season? Email “Fans of Munster and Connacht give us their take on new season”. Feedback on “Fans of Munster and Connacht give us their take on new season”.